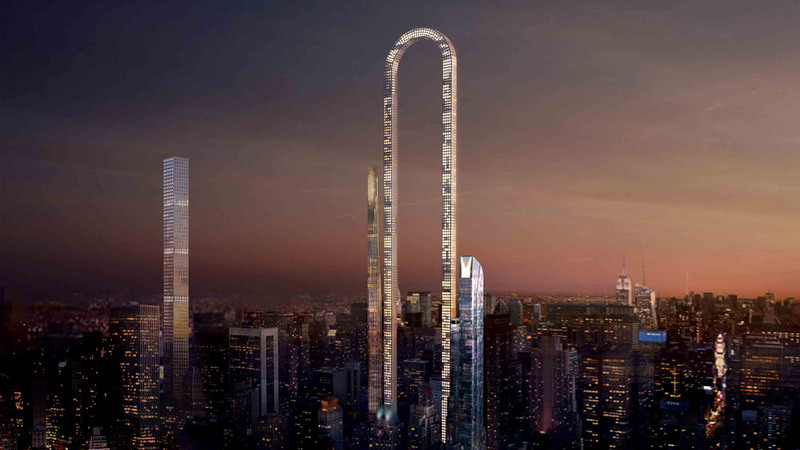 Oiio imagines The Big Bend skyscraper for New York as "the longest building in the world"
In response to the swathe of supertall luxury residential towers rising in New York, local studio Oiio has proposed a conceptual skyscraper that loops over to boast length rather than height. The Big Bend would be formed from a very thin structure that curves at the top and returns to the ground, creating what the architecture firm describes as the longest building in the world – at 4,000 feet (1.22 kilometres) end to end. Oiio, based in New York and Athens, came up with the proposal to highlight the race for height between Manhattan's luxury condo developers. Real-estate companies are capitalising on a planning law that permits them to purchase air rights from neighbouring buildings, allowing for taller and taller towers on relatively small plots. 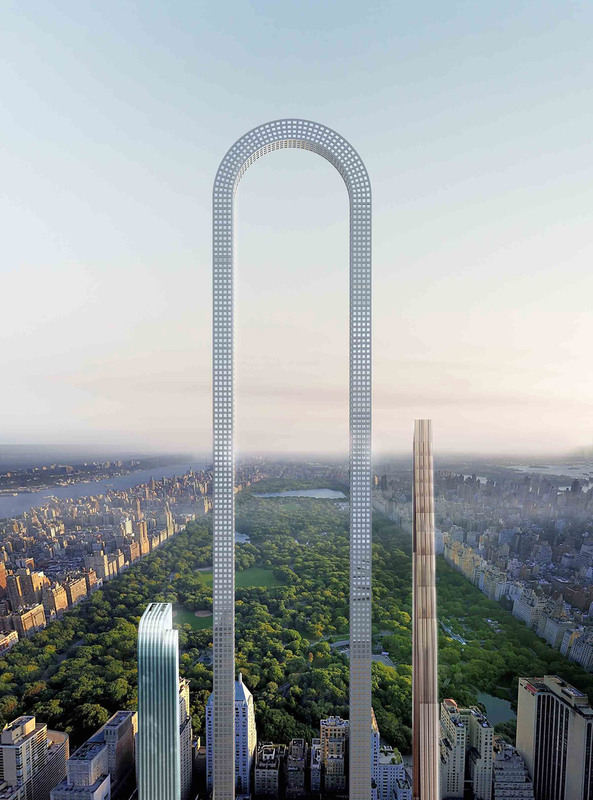 "The story of The Big Bend follows a recent trend that has appeared in New York City: the emergence of myriad tall and slender residential skyscrapers," said the studio. "New York City's zoning laws have created a peculiar set of tricks trough, which developers try to maximise their property's height in order to infuse it with the prestige of a high-rise structure," it continued. "But what if we substituted height with length? What if our buildings were long instead of tall?" 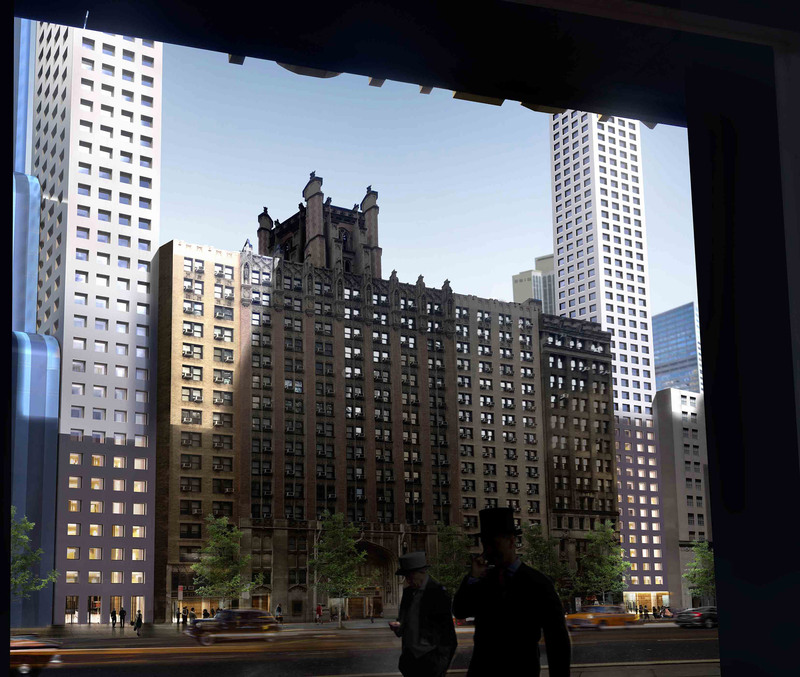 Renderings show The Big Bend among the luxury apartment towers proposed and under construction on and around West 57th Street, just south of Central Park, which has become known as Billionaire's Row. Skinny skyscrapers including SHoP Architects' 111 West 57th Street and Christian de Portzamparc's One57 are both rising on the street, while Jean Nouvel's 53W53 and Rafael Viñoly's 432 Park Avenue are both nearby. The Skyscraper Museum has nicknamed them "super-slenders" due to their extreme base-width-to-height ratios. 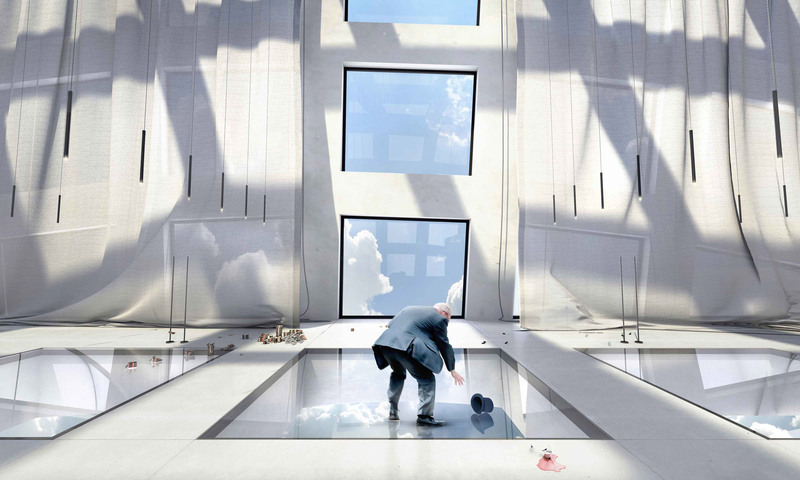 Oiio's design features a grid of large windows, similar to those on Viñoly's skyscraper, but with even smaller floorplates. Its legs would straddle a historic building to fit into narrow plots either side, then rise to tower over both SHoP and de Portzamparc's buildings. "If we manage to bend our structure instead of bending the zoning rules of New York, we would be able to create one of the most prestigious buildings in Manhattan," the studio said. Some of New York's prominent architects have spoken out against the number of luxury residential skyscrapers classed as supertall – measuring between 980 feet (300 metres) and 2,000 feet (600 metres) tall – rising in the city. Steven Holl said the buildings symbolise inequality in architectural form, while Liz Diller said that the city is at risk of being "consumed by the dollar". Locals have also voiced concerns about the towers, complaining that they will overshadow Central Park.